the improvements are on the encoding, you will see it in streaming and recording. I can confirm that as i have already streamed well over 12 hours with this beta. 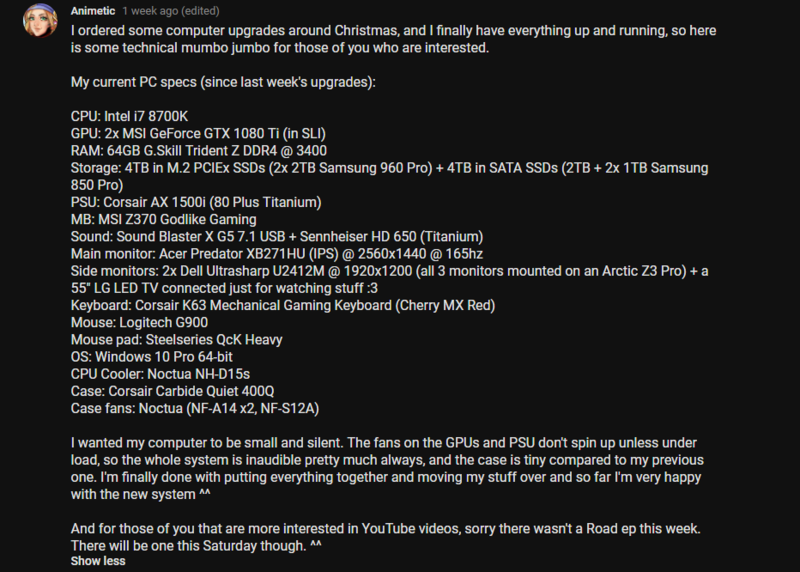 After this comment i will be streaming and testing out performance with streaming 3440x1440 60fps since both 1080p and 1440p standards have already shown stellar results its time to see how far it can be pushed. I would like to add that 3440x1440 does infact work well, but the bitrate you need for it to look perfect is 10000-12000 kbps, which you can use on twitch but I found that it causes issues with the stream at this bandwidth (stream cuts in and out). 2560x1080 works fine for a lower resolution ultrawide stream however and it works well at 6-7000 kbps with minimal pixelation! Would like to say OBS team and Nvidia are doing amazing work, because I have never been able to stream at this quality before on my setup. I can actually stay on top of the leader boards on battlefield while streaming on the same rig and its feeling great :D. I will report back if I find anything else. The short answer for those settings is that they may increase visual quality at the cost of GPU usage. This doesn't happen with the regular version of OBS. This build contains a new implementation of NVIDIA's NVENC encoder in OBS using the new NVIDIA SDK as well as implementing some new performance improvements. Specifically, the main improvement in this build is that frames from OBS are no longer sent to system RAM prior to being sent to the NVENC encoder -- instead, the frames are sent directly from VRAM, which should noticeably reduce resource usage. The quality improvements you may have been hearing about will largely only be seen on Turing GPUs (RTX 20XX), but the performance improvements should be measurable on all GPUs that have NVENC (GTX 6XX and higher). THIS IS A BETA, USE AT YOUR OWN RISK. Please report your findings on this thread or in the #beta-testing channel on the OBS Discord. In particular, please test your performance at high GPU load compared to the Release version of OBS (22.0.2). Note that, due to being a beta build, this binary is not signed, and may have issues with game capture. If you want to make game capture work, you can copy the capture plugin from the release version of OBS. To do this, copy the data/obs-plugins/win-capture folder in the release OBS install directory and overwrite the corresponding folder in the beta directory. Could you share the OBS patch for the performance improvement? To avoid the memory copy from system RAM to VRAM? Hi all, I have a question about this beta. I'm not partnered with Twitch so I cannot use the transcoding feature; as for this I cannot set a 6000 bitrate cause many people have not enought bandwith to download the video. Are there any kind of improvements at 720p/60 fps with 3500 bitrate with a RTX Card using the new features? Awesome! Thanks for the sharing, amazing job! Can i ask if this beta version is complete about the quality optimization? I mean, can we expect more improvements about quality and performance for the final release or this beta rappresent the best quality we can get even with the final release? @dodgepong I have the same stuttering issues while streaming. I was testing with Destiny 2 so I was stuck using window capture and display capture. I tried the eight buffers version as well, same results. I tried turning off look-ahead, psycho-visual tuning, 4->2 b-frames, different presets, nothing seemed to help. Thank you for the special build. I'll try it out in tonight's stream. By GPU usage do you mean those graphs in the Windows Task Manager? Anything in particular that I should be looking out for? Can anyone confirm if anyone else is getting skipped or dropped frames when another active screen goes on? I usually disable preview mode or go into performance mode on both obs versions when i stream or record - playing max setting at 3440x1440 with all extra nvidia options in FFXV on x264 fast on 2700x i get no skipped or lagged frames - new nvenc though shares same results until you turn on say preview mode or introduce another active screen like twitch playback? OBS records fine when I use the new NVENC and GPU 0 - but when I want GPU 1 to be used... it doesn't record. So what recording settings are you guys trying for this obs beta build? what would you recommend for a nice 1080p 60fps recording? The primary purpose of this beta is to test the performance improvements described in the OP. There are a few unrelated improvements also included in the build just because they were things merged prior to beginning the beta but after the last release, but they shouldn't affect testing of the new NVENC code. The visual quality is pretty much completely up to NVENC I would not expect any changes in visual quality between the beta and release. Thank you for the feedback, that does help. Largely, yes. The main issue we're trying to work with is that this build can have these stuttering issues if GPU usage is maxed out, or nearly maxed out. Perhaps a better way to fix the problem is to limit FPS in the game you are playing. You have to use NVENC on the GPU that OBS is running on. Furthermore, dual GPU systems in general end up leading to much worse performance when it comes to using OBS due to the need to copy textures back and forth from GPU to GPU. Trying to run the game on one GPU and running OBS on another GPU is actually a bad idea for this reason, and isn't even really possible.